Seventh Street Books, 9781616147143, 160pp. A worthless bird statuette -- the focus of Dashiell Hammett's The Maltese Falcon. And much more. As Dashiell Hammett closes his final case as a private eye, the details of which will later inspire his most famous book, he acquires at a police auction the bogus object of that case, an obsidian falcon statuette. He casually sets the memento on his desk, where for a decade it bears witness to his literary rise. Until he gives it away. Now, suffering writer’s block, the famous author begins to wonder about rumors of the falcon’s “metaphysical qualities,” which link it to a powerful, wish-fulfilling black stone cited in legends from around the world. He can’t deny that when he possessed the statuette he wrote one acclaimed book after another, and that without it his fortunes have changed. As his block stretches from months to years, he becomes entangled again with the scam artists from the old case, each still fascinated by the “real” black bird and its alleged talismanic power. A dangerous maze of events takes Hammett from 1930s San Francisco to the glamorous Hollywood of the 1940s, a federal penitentiary at the time of the McCarthy hearings, and finally to a fateful meeting on New Year’s Eve, 1959, at a Long Island estate. There the dying Hammett confronts a woman from his past who proves to be his most formidable rival. And his last hope. Gordon McAlpine is the author of numerous novels as well as a middle-grade trilogy, The Misadventures of Edgar and Allan Poe. Additionally, he is coauthor of the nonfiction book The Way of Baseball, Finding Stillness at 95 MPH. He has taught creative writing and literature at U.C. Irvine, U.C.L.A., and Chapman University. He lives with his wife Julie in southern California. "Staggering. A must-read not only for mystery lovers and fans of The Maltese Falcon, but vital to writers. Writer's block will never be quite the same again. Wonderful novel, sublimely clever." "It's a sort of literary conceit-within-a-conceit-within-another-conceit, and it succeeds very well. 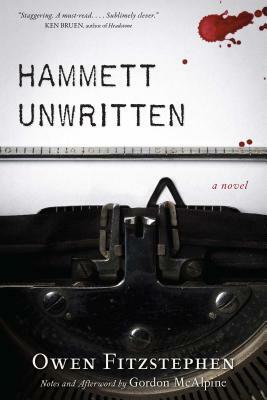 Readers who prefer to just focus on the story at hand will be rewarded with an exciting tale with a compelling protagonist (Hammett was a real-life larger-than-life character), and those who enjoy literary games-playing will have fun sorting it all out."